For almost half a century Kernowcraft has become known for quality and personal service. You can be assured that you are buying from a trusted company that cares about the products we sell, where they come from and who we are selling them to. All our products are authentic. That means genuine semi-precious or precious gemstones from trusted sources. All items comply with hallmarking laws where applicable and comply with EU nickel regulations. We pride ourselves on running our business as a genuine and reliable supplier that you can trust. We absolutely believe that we should only stock products that we believe in, know are good quality and will last. Our tools are tried and tested in our workshop and will withstand the test of time. You can be sure that your creations using our products will last and be worthy of the time and skills that you put in to them. We are an environmentally and ethically minded company - our team share your concerns. We do our best to reduce our environmental impact and recycle wherever possible. We build longstanding relationships with trusted suppliers and ask for reassurances that they treat their workers with care. We want you to be happy and confident ordering from us, simply put, if you're not happy, we're not happy. We are sure that you will be delighted with your purchases from us, but if for any reason you are not, you have 30 days to return them to us for a refund or exchange, simply follow our simple guidelines. Our team at Kernowcraft work hard to ensure that you will not only love our products but also enjoy shopping with us. We want you to be happy and confident ordering from us, which is why we try to treat our customers the way we ourselves want to be treated when we shop. We want you to feel confident that if you have a problem with anything you have bought, we will do everything we can to resolve it for you. All our products comply with UK hallmarking laws. Any silver item weighing over 7.78g is hallmarked, sterling silver items under this weight may be stamped 925. 9ct gold items weighing over 1g, will be hallmarked. 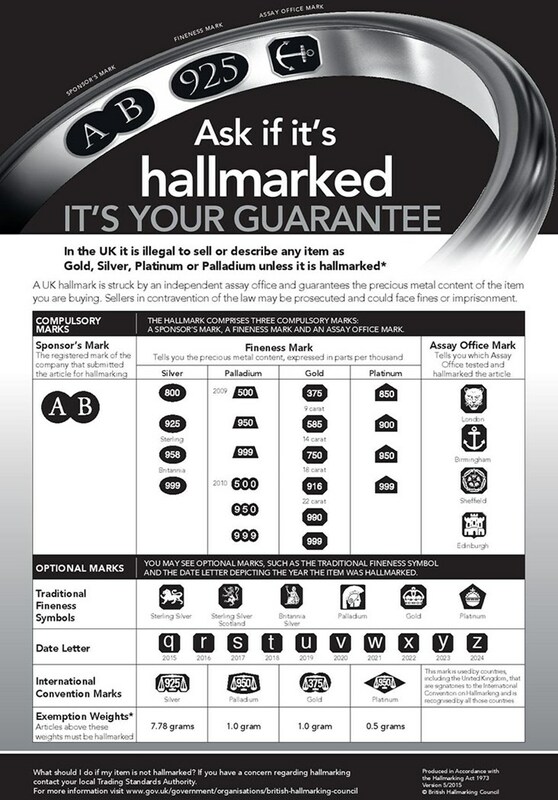 See our dealers' notice for further details on hallmarking. More information can be found with Assay Office London.